The page is designed to help you find trusted wedding suppliers who work with professionalism and integrity to create your dream wedding. 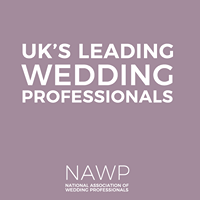 All the suppliers on here are members of the National Association of Wedding Professionals - NAWP . Please feel free to post your requirements, request recommendations or ask wedding questions - our wedding suppliers will be on hand to help you. Enjoy your wedding journey with us at UK’s Leading Wedding Suppliers - NAWP!